The mother of Sgt. La David T. Johnson, who was killed in an ambush by Islamist militants in Niger this month, told The Washington Post newspaper on Wednesday that US President Donald Trump "disrespected" her son in a condolence phone call. Cowanda Jones-Johnson backed the account of Florida congresswoman Frederica Wilson, a Democrat, who claimed Trump told Johnson's widow, Myeshia Johnson, that her husband "must have known what he signed up for." "President Trump did disrespect my son and my daughter and also me and my husband," Jones-Johnson told The Washington Post. Trump's statement was first reported by Wilson, who said she was with Johnson's widow on the way to receive the fallen soldier's remains at Miami International Airport when the president called to express his condolences. According to Wilson, Trump told Myeshia Johnson that her husband "knew what he signed up for ... but when it happens it hurts anyway." The representative described the president's statement during the five-minute call as "so insensitive" in an interview with Miami Local 10 news. After the phone call, Myeshia "was crying, she broke down." Referring to President Trump, Wilson said 'he didn't even know his name.'" President Trump lashed back, terming Wilson's claim as "totally fabricated." Trump later told reporters: "I did not say what she said," and "I had a very nice conversation." When asked about what "proof" he could offer, Trump said: "Let her make her statement again then you will find out." 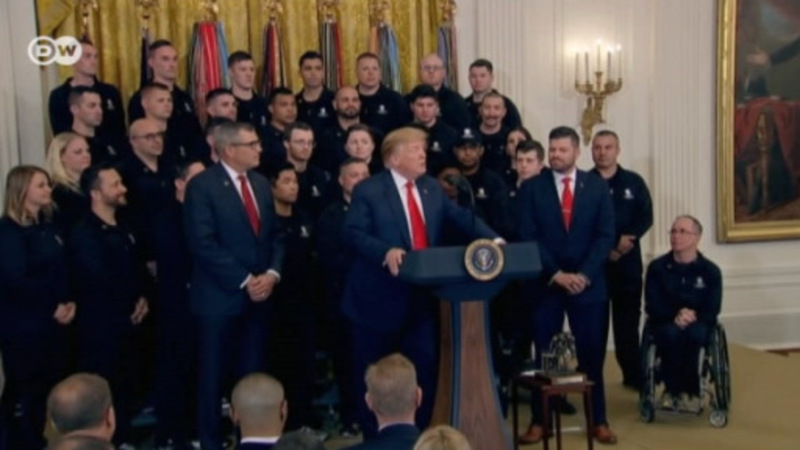 Before Trump's tweet, the incident had already gone viral on American media, making it the latest event in a growing controversy following Trump's accusation that past presidents often did not honor fallen military servicemen and women. At a Monday press conference, when pressed on whether or not he had reached out to the relatives of troops killed in an October 4 ambush in Niger, President Trump claimed that previous presidents had not contacted family members of soldiers who had died in combat. "The traditional way, if you look at President Obama and other presidents, most of them didn't make calls. A lot of them didn't make calls," Trump said on Monday, later adding that he didn't know whether President Obama in particular called fallen soldiers' families. "President Obama, I think, probably did sometimes, and maybe sometimes he didn't. I don't know. That's what I was told," he said. "All I can do is ask my generals. Other presidents did not call, they'd write letters. And some presidents didn't do anything." In response to Trump's claim, retired army General Martin Dempsey tweeted that both President George W. Bush and President Barack Obama honored military service and implicitly criticized Trump for politicizing military deaths. Trump also drew his own chief of staff, John Kelly, into the controversy during a Tuesday interview on Fox News Radio. "You could ask General Kelly, did he get a call from Obama?" Trump said, referencing Kelly's son who was killed in Afghanistan in 2010. According to US media reports citing an anonymous White House official, Obama did not call Kelly upon his son's death, though it was not known whether the former president wrote a letter. Obama did receive Kelly at a White House breakfast for family members of soldiers killed in combat. There is no official protocol outlining presidential actions to be taken upon death of military servicemen and women. However, it is typical for presidents to express their condolences in a phone call or letter. Some also visit air bases or airports to receive the remains of the fallen as they are flown back to the US.